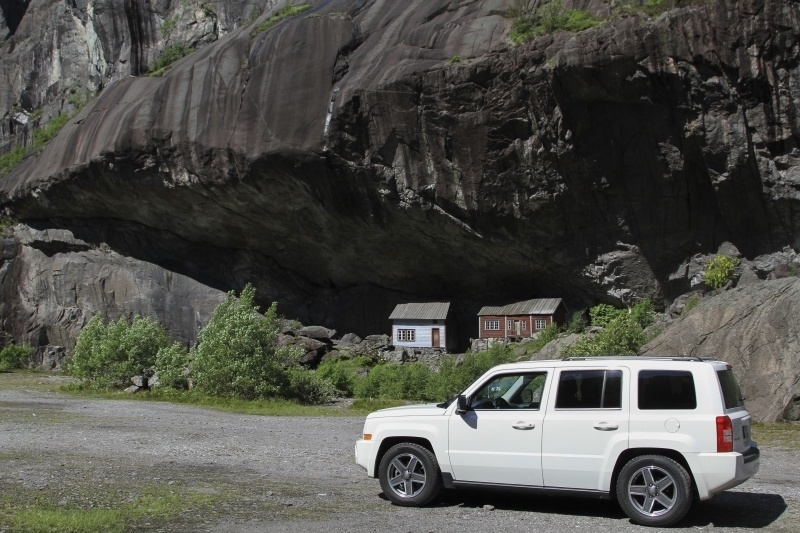 If you are going to travel light, summer is by far the easiest time to do so. Saying that, Jim and I are heading to Ukraine and Belarus, so we’re not packing for the beach. We’ll be city-hopping. We’re not fans of spending our hard-earned money on expensive flights, and we certainly don’t like paying for baggage. For this trip, we are flying two different airlines and one of the airlines only allows a personal item for each person not to exceed 43 cm by 22 cm by 22 cm. You read that right, only one personal item each. That’s not much, but we are determined to do it without paying for a bag. Oh, by the way, we’ll be gone for eleven days. Here’s how to pack for summer and only use those free carry-ons for two people. 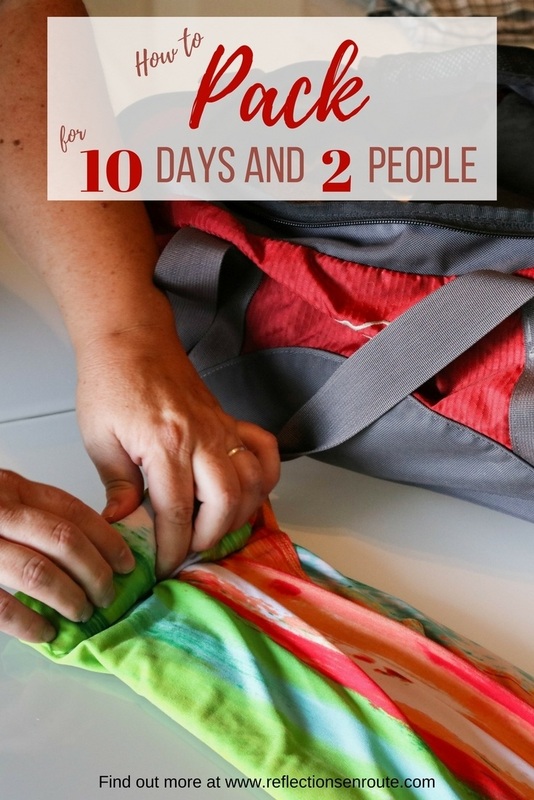 How to pack a small bag for two people! 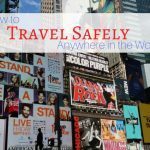 Have you and your travel partner ever gone away for eleven days and only taken two carry-ons? What are your packing tips? Our first decision is to determining how to pick the best carry on luggage. We’ve decided on a day pack and a small soft-sided satchel. Since we can only take one personal item, that means no purse. We might be able to get away with a belt pack, but we don’t own one, so that’s just not an option at this point. So, with these two bags, we’ve got to fit in Jim’s clothes, my clothes, our toiletries, and of course our gear and a few miscellaneous items. 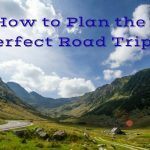 Europe can be warm or chilly in summer, and that means that you need to plan to have at least a light jacket or fleece in case the temperature dips or it gets rainy. We’ve got our light fleeces ready to go. We’re not going to bring rain gear and hope that we don’t get soaked. If it starts raining, we’ll just pop into a cafe or a museum. Other than our fleeces, we’re going with light summery ensembles. We both like to have a few different outfits, so we are each bringing a total of three pants with two shirts each. This is an easy six days, and since we’re only going to three cities, we have enough time to wash some things out and let them dry if we need to. 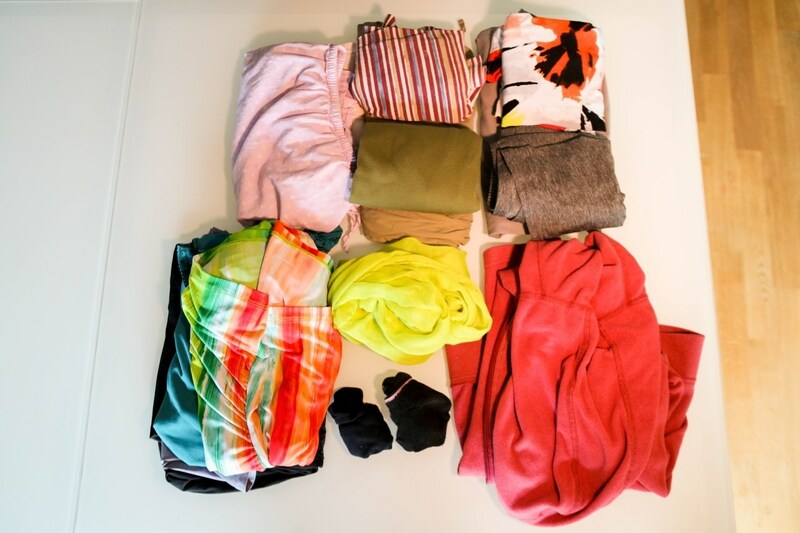 Other than a few underclothes (five pairs of underwear each and an extra bra for me), the only difference in our wardrobe is that I have to include a scarf. A scarf comes in handy if we enter a religious building where women need to cover up, or gives me a chance to dress up an outfit if I need to as well. Toiletries are so different from person to person, but Jim and I are going with the bare minimum. We know that no matter where you go in this global economy, we’re going to be able to buy anything we need. Of course we still need to bring enough for the two weeks. 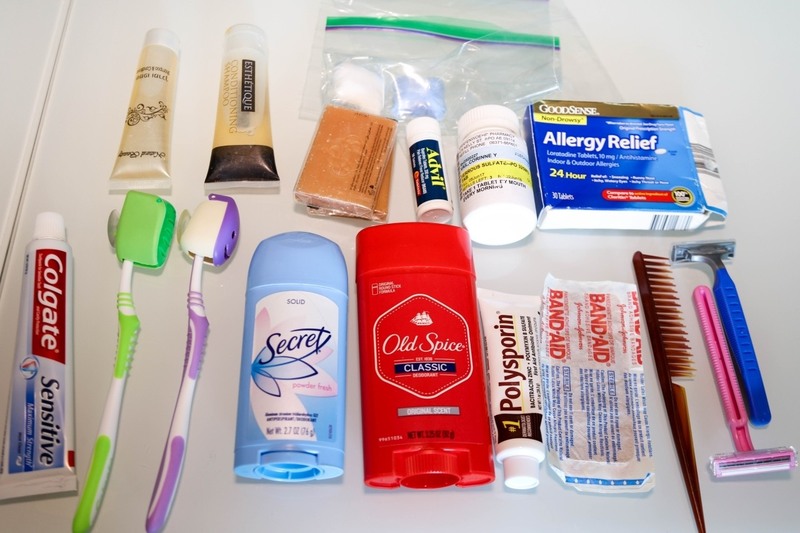 We carry our everyday items like toothbrushes, paste, shampoo, and deodorant, and a comb. Luckily we both have short, easy to deal with hair and it’s no big deal if we forget the comb altogether. We know this, because yes, it’s happened. We certainly don’t want to buy anything we just don’t need. We do bring a couple of laundry tablets for clothes washing as well. 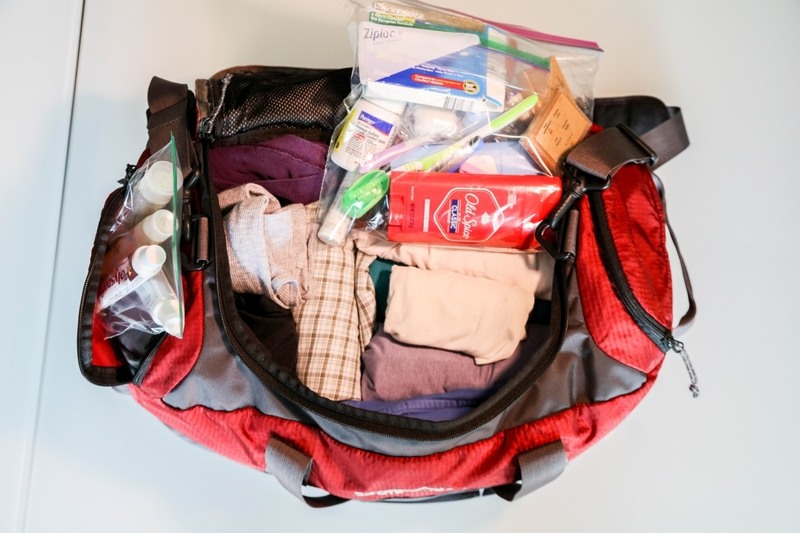 For keeping healthy on the road and being ready for a small emergency (first aide), I know many people like to be really prepared by bringing a full kit. We don’t have any idea what might happen, and in most cases will rely once again on local stores if we find we need something, but the few things I always bring are allergy relief , aspirin, a topical antiseptic, and band aids. These are items that I’m okay with not using, but I do like to get rid of headaches and breathe or clean a bug bite or cut if I get one. Lastly, we have a couple of prescribed medications we need to bring along. For those, I always make sure to leave a good, readable label on so if I run out I can show the package with the prescription to the local doctor. I also have a picture of my medication labels on my phone, in case they get left behind or lost. Honestly this takes up as much, if not more room than our clothes. For this trip, since we are staying in cities, we’re taking the bare minimum. Therefore I’m only taking one lens for my DSLR camera, and it’s killing me but I’m leaving my tripod at home. It pretty much can only make the cut if we are paying for a bag. 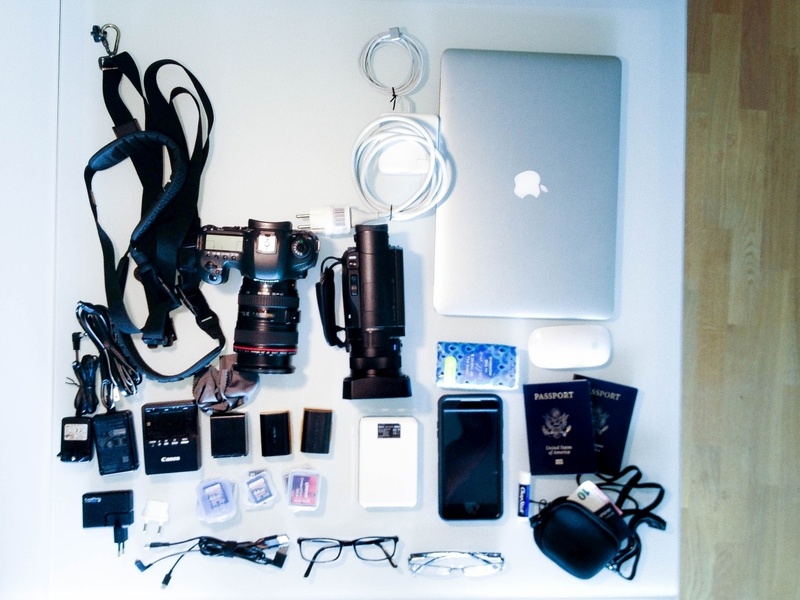 So, as you can see above we have: our laptop, camera, video camera, iPhone, chargers and adapters, some extra memory cards and batteries, our reading glasses, passports, and money. Believe me it’s not nearly as much as I’d like to bring. If we were traveling longer, we would be bringing an entire case full of gear. It’s a pain, but we use so much of it all the time. It’s all about the roll! 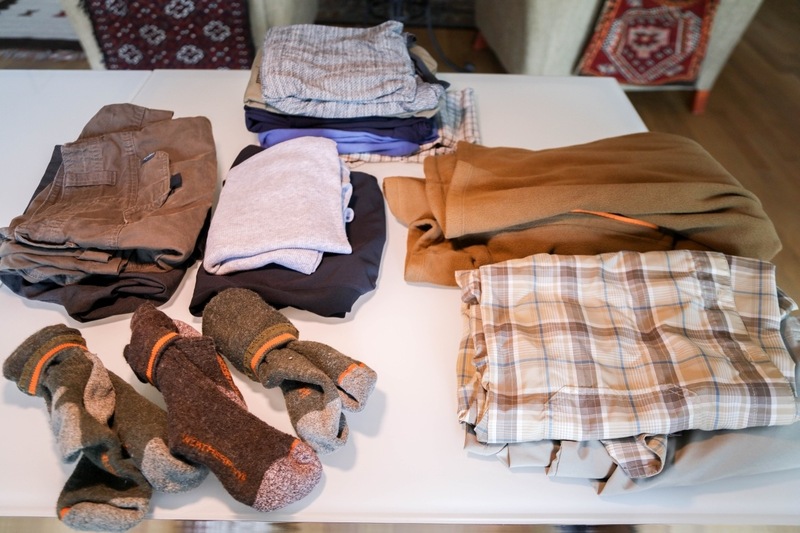 Both sets of clothes, his and hers, are going in the soft satchel, and we’ll put our gear and fleeces in the backpack. We start off strategically placing the clothes in the bag with Jim’s on the left and mine on the right. We also make sure we have our pajamas on top, so when we get in late at night we can just pull them out quickly. This flight gets in early afternoon, so it’s not such a big deal; it’s just habit. On top of everything is our big toiletries bag, the one with no liquids. 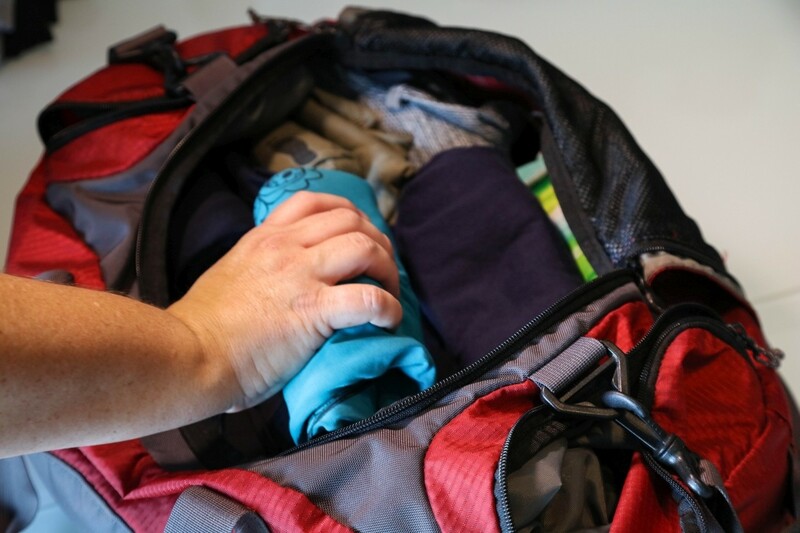 The smaller, liquid bag is in its own plastic baggie in a side pocket, easy to pull out so we can get through security quickly. Fully packed and ready to go. Next up is packing the gear and important papers, like our passports, in the backpack. We’ll probably haul the backpack around the city as well, so we want to pack it so we don’t have to do much when we get to the hotel to be ready to go. First I put all the cords and cables at the bottom of the pack with my fleece on top of them. 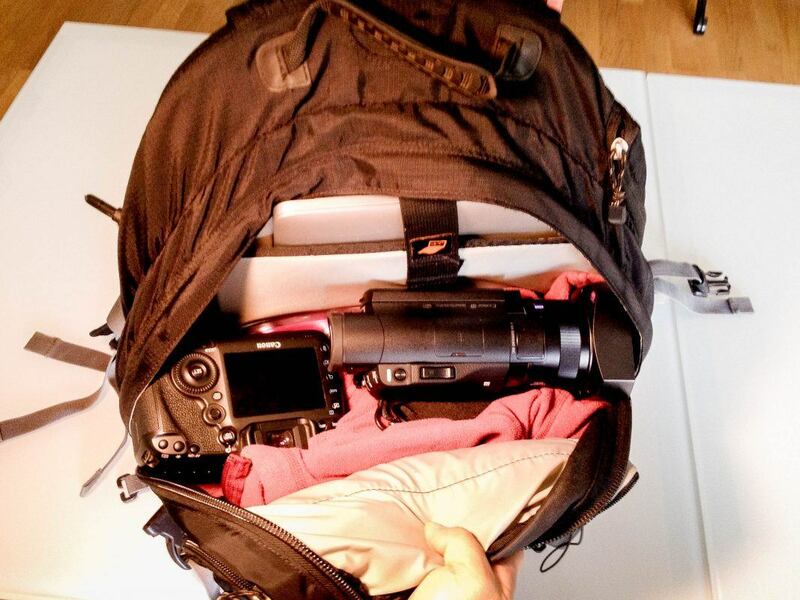 This will help cushion our camera and video camera, by using the sleeve to weave between the two so they won’t knock together during the flight. They have to be easy to get to because we know we might have to pull them out and turn them on at the security check. I would say we’ve had to do this 50 % of the time. Our backpack has a zipper for the laptop, and that will definitely be coming out at security, so we love that it’s easily accessible. On top of the cameras we put extra cushion with Jim’s fleece. Using my fleece to buffer the cameras. And there you have it. Two small, small bags for two people for ten days. Honestly, if we didn’t love our gear so much, we could travel with this much for a pretty long time since we don’t mind washing things out little by little when we travel. I would rather not pack enough then too much. Every time I get home from a trip, I get really grumpy to find out that I’ve packed an item and not used it, so I try extra hard not to do that. Pin Packing for Two for later! I wish I had the knack! I’m very bad at packing, it’s the worst part of travelling. I prefer all the laundry when we get home to actually making decisions about what to take. Anabel, I wouldn’t mind it, but we chose not to pay for a suitcase. We’ll see how it goes. Rhonda, It’s hot! LOL. We’ll see how we did while we’re gone. Janette, That one is an Eddie Bauer and we’ve been using it for about five years. Well done Corinne. Even for longer term trips, we are going lighter and lighter these days. We did a 4 month trip through Qatar, Myanmar and Thailand earlier this year. Medium sized suitcase and we did laundry every 7-10 times. Laundry is so cheap in most places and the lightened load made traveling so much easier. I could even carry both mine and my wife’s suitcases in a few different scenarios when we needed to walk up a few flights worth of stairs. Ryan, Yes, those stairs are hard, and thankfully Jim does the same. Good on ya! Michelle, Yes, we try. And thanks. Same thing happened to us when traveling to Europe through Iceland. Only one personal item was allowed. You had to pay for a carry on every flight (we had 4). We ended up taking one carry on and two backpacks for 17 days. 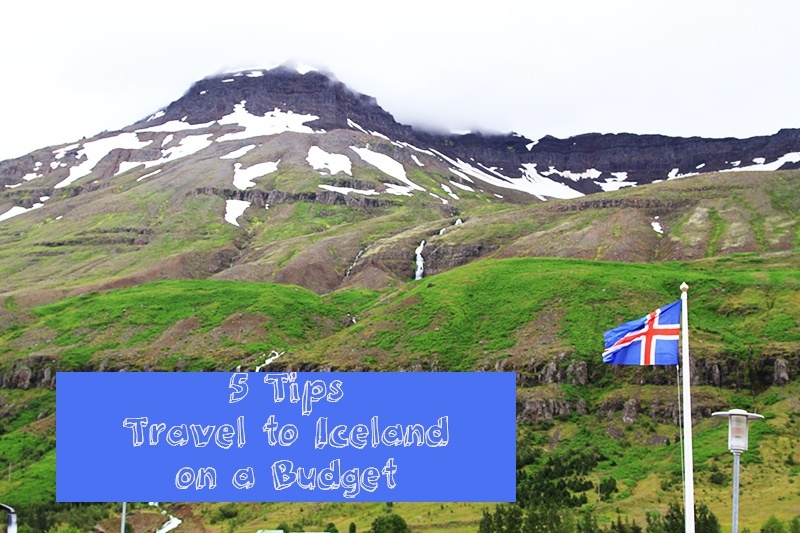 The only thing is that we had to pack some “fluffy” clothes for Iceland. But, we were able to pack all clothes on the carry on. Use one of the backpack for shoes and the other one for gear and papers. After that, I think we are not going back. Every year we take less and less (and it works excellent). Ruth, I kind of love it when I’m forced to pack light…no excuses.